the first one was so precious to receive in the mail I figured I would make a second one! ============================================ hello! first of all this will be a P.C. swap, but with a twist. you will have 5 partners to send postcards to. each postcard will include a dare; bucket list type activity for the recipient. nothing too crazy, maybe its something you do often that you find others don't, or something you've always wanted to do. I.E. try a new food, change in routine, travel to different parts of your hometown. I would definitely give each profile a read to see what would be a plausible bucket list activity for your partner. I feel like this swap would have a whole lot of fun attached to it! here's to adventure, right? p.s. 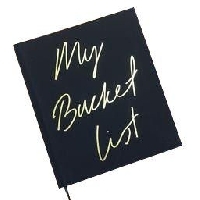 for added fun once you try it, add a section on your page about the updates on your bucket list ? One up ket item per card.? That auto correct! One bucket item per card? @magenta3 yes! one is required. if you want to send more than one idea you can, but the receiver really only needs to have the intentions on completing one activity. Any rules about what sort of post card? I’m loving this swap, the postcards and the dares. I made a section on my profile called Swaps that will be for recording the dares and my attempts at doing them (and for any other info for other swaps should that need arise).